Cewsh: Hey, guys. As you know, we've started adding some columns written on the Rajah forums here on the mainpage to give some of the people there a chance to shine. You've seen myself and Defrost with our columns, and now this is THE LAW's running WCW PPV Flashback series. Whether it gets picked up full time remains to be seen, but if you like it and want to see more, make sure you come to the Rajah forums and let him know you liked it! COME DISCUSS THIS FEATURE IN IT'S OFFICIAL THREAD ON THE RAJAH FORUMS! And now let's let him explain why he tackled this project in the first place. I've always loved WCW. As an eight year-old in late 1997, WCW was the company that introduced me to wrestling. I was fascinated by the stories I was seeing on my screen. At the time, WCW was on top of the wrestling world. They were beating Vince McMahon like no one else in history had ever done. They had risen from a regional promotion to the most successful wrestling company in the world. And then, less than four years later, they were out of business. This is the story of how that happened. WWE has a version of this story. In their version, WCW did a few good things but was mostly an incompetent company that only did as well as they did because of Ted Turner's money and Eric Bischoff's underhanded tactics. I'm going to tell you the real story. I'm going to tell you the story of the company that created the pay-per-view supercard with the first Starrcade in 1983. Oh, you didn't really think that Wrestlemania was the first pay-per-view, did you? I'm going to tell you the story of the company that truly embraced global wrestling, bringing in stars from all across the world and putting them on top. I'm going to tell you the story of the company that brought Vince McMahon to his knees, and how they threw it all away. I started this project because I want to show everyone that WCW is more than just the Shockmaster, the Black Scorpion, and David Arquette. Far from a joke, WCW produced many of the greatest wrestling matches the world has ever seen. I want everyone to understand the greatness of the Flair/Steamboat trilogy, of War Games, of the Cruiserweight division. I want everyone to know the story of the Dangerous Alliance, of the New World Order, and the Four Horsemen. This is the story of Ric Flair and Ricky Steamboat, Sting and Lex Luger, Hulk Hogan and Goldberg. Of Diamond Dallas Page and Booker T, of the Steiner Brothers and the Road Warriors. This is the story of one of wrestling's greatest companies. This is the story of World Championship Wrestling. Welcome to the WCW Pay-Per-View Flashbacks! I’m choosing to start with Chi-Town Rumble because this is the first show after Ted Turner bought out Jim Crockett Promotions from Jim Crockett. First, allow me to briefly recap the events that brought us here: Jim Crockett Promotions was one of many regional wrestling companies in the United States. When Vince McMahon took the WWF national in the early 1980s, Crockett emerged as his top competitor. Vince owned the north, Crockett owned the south. Crockett began to consolidate talent and buy out other southern promotions, seeking to go national in his own right. Crockett beat Vince McMahon to the punch on pay-per-view when he promoted the first Starrcade on Thanksgiving night 1983. The show was broadcast on closed-circuit television to the arenas around the south that JCP ran. Starrcade was a major success, and became an annual tradition. The WWF launched Wrestlemania in 1985, giving JCP competition in the pay-per-view business. That competition really heated up in 1987 when the WWF ran the first Survivor Series on Thanksgiving night, seeking to undercut Starrcade. McMahon also informed the pay-per-view providers that any company who aired Starrcade would not be allowed to broadcast Wrestlemania. This led almost every pay-per-view provider to decline to broadcast the show, resulting in financial disaster for Crockett. Jim Ross and Bob Caudle are our hosts. They open with an interview with Steamboat who talks about his love for his family. He's joined by his wife and young son. Reed is billed as "Hacksaw." Only one man in wrestling should be allowed to have that nickname. Reed is an African-American power house, in many ways reminiscent of Ron Simmons, with whom he would later form a tag team. Sting gets a huge pop upon his entrance. This is after his great battle against Flair at Clash of the Champions in 1987, so it's well-known that he's the future of WCW. Long stall session to start. The announcing is already in contrast to WWF events: the announcers are analyzing the strengths and weaknesses of the wrestlers and how they match up. This is a battle of Sting's athleticism against Reed's power. Reed rolls outside after a dropkick from Sting. JR puts over Sting as a revolutionary wrestler who has both size and leaping ability, comparing him to Magic Johnson. Sting applies a long Headlock. The PA announcer says that five minutes have passed. Before the match they announced it as having a 45 minute time-limit, which is an interesting way of making it seem more like a legitimate sport. Sting works on the arm. This is very boring so far, nothing but basic mat wrestling. Reed bails again. He gets back in, hits some power stuff, but Sting regains control and goes back to the arm. Sting applies a long Armbar. Reed eventually makes his way to his feet and throws Sting to the floor. Reed starts a heat segment at ten minutes in. It's really just punches and boot grinding. Reed applies a chinlock. He proceeds to hold it for several minutes. Sting finally fights out and starts his comeback. Sting tries a Vader Bomb, but Reed gets his knees up. Reed ends up applying another Chinlock. Sting gets out with a Jawbreaker. Sting hits a big clothesline and the crowd goes crazy. Sting's comeback is stymied when Reed throws him to the floor. Sting gets to the apron and executes a Sunset Flip for the win at 20:04. Analysis: 1/2*. Sweet Jesus was that boring. Twenty minutes of rest holds. No idea what the point of that going 20 minutes was. Backstage we hear from Paul E. Dangerously and the Midnight Express. Paul E. Dangerously is, of course, Paul Heyman. He's young and has all his hair here. He introduces Jack Victory, who will be replacing Dennis Condrey in this upcoming match. Condrey Randy Rose will face the new Midnight Express (Bobby Eaton and Stan Lane) with the loser having to leave the NWA. We hear from Cornette and the New Midnight Express in the back. Classic Cornette promo, lots of yelling. The individual who gets pinned in this match has to leave the NWA. Randy Rose and Dennis Condrey were original members of the Midnight Express, Lane and Eaton are the best-known incarnation of the team. Lane starts against Rose. Rose goes up top early but gets caught and slammed. Lane clotheslines Rose to the floor. Rose tags out to Victory. Lane tags to Eaton, then hits a Drop Toe Hold. Both Lane and Cornette drop elbows. Quick tags by Lane and Eaton as they control. Rose tags back in. Eaton ends up getting thrown from the apron onto the guardrail in a devastating bump for the time. Dangerously tags in and beats on the wounded Eaton. As soon as Eaton gets up, Dangerously runs to tag Rose. Cornette tags in and demands Dangerously tag in. Worth noting those two hate each other in real life, although I don't think that had developed yet. Rose slams Cornette and tags Dangerously. Cornette makes a comeback, but Dangerously tags out to Rose. Rose and Victory both pummel Cornette. Cornette makes the hot tag to Lane. Victory manages to take Lane down after Dangerously distracts him. Rose tags in and works over Lane. Rose throws Lane to the floor and hits a Fist Drop from the top rope. Back in the ring Rose continues to dominate. Rose tries a Piledriver but gets backdropped. Victory tags in as Cornette rallies the crowd. Lane blocks a corner charge and tags in Eaton. He slams Victory and goes up top. Missile Dropkick! Eaton grabs Victory's hand and tags Dangerously! Cornette tags in! Cornette beats down Dangerously, but his pin is broken up. Rose and Lane tag in. Lane slams Rose and misses the Alabama Jam Leg Drop from the top rope. Rose eats a Double Flapjack and is pinned by Lane at 15:54. Analysis: ***1/4. Good match. The crowd was really into it and the hijinks with Cornette and Dangerously were a lot of fun. Ric Flair interview in the back. Flair says he's beaten every great wrestler in the world and he'll beat Ricky Steamboat tonight. Backstage, Rick introduces his brother Scott. This is Scott Steiner's WCW debut. Scott says Rick got in a car accident, which explains his bizarre behavior. Rotunda is best known for playing IRS in the WWF in the early 1990s. Both guys here have backgrounds as amateur wrestlers. Rotunda wrestled at Syracuse, Steiner at Michigan. They exchange basic holds early. Rotunda ditches the amateur stuff and starts hitting Steiner with forearms. Steiner ends up Clotheslining Rotunda out of the ring. Back in the ring Steiner hits another clothesline and plays to the crowd. Rotunda manages to lock in an Abdominal Stretch while holding the rope. He holds it until Teddy Long catches him. Rotunda rides Steiner and locks in an arm lock. Back to their feet, Steiner shoots Rotunda to the ropes and Back Drops him. Steiner goes up top. He misses a Splash. Steiner makes his way to the feet and hits a big Power Slam. He doesn't go for the cover because he gets confused. Kevin Sullivan emerges from the locker room and says he likes Steiner's dog. Rick is distracted, but ultimately goes back into the ring. Rotunda hits a suplex, but Steiner kicks out. 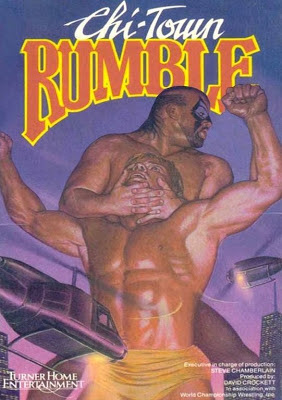 Rotunda misses a Drop Kick and Steiner applies a Sleeper Hold. Steiner lays back for leverage and is pinned by Rotunda. Rotunda wins the TV Title despite being out cold at 15:27. Analysis: ***. Good traditional wrestling match. Both guys were very good mat wrestlers and they did a good job of playing up Rick's character and simplistic nature. Backstage we hear from the Road Warriors and Paul Ellering. This stems from Windham turning on Luger to join the Four Horsemen months ago. They run the ropes and Luger locks on a Sleeper. Windham powers out with a Back Suplex. Luger no-sells and hits an Atomic Drop. Military Press from Luger and the crowd goes wild. Luger Backdrops Windham. Luger goes up top (!) and misses a Cross Body Block. Windham pounds on Luger outside the ring. Suplex from the apron into the ring. JR says Luger was an offensive lineman in football. He's right; Luger washed out of Penn State and the University of Miami before playing in the Canadian Football League and USFL. He actually played with Ron Simmons on the Memphis Showboats. Anyway, Windham is still working over Luger. He misses a punch, hits the ring post, and appears to have broken his hand. Windham applies The Claw, a head squeeze. But his hand is broken, so he can't hold it. Windham hits a Front Powerslam, but Luger kicks out. Windham connects with the Superplex. Luger kicks out. Windham hits a German Suplex and bridges into the pin. His shoulders are down, but Luger raises his shoulder before the three count and gets the pin at 10:44. Analysis: **3/4. Decent match. Could have used more hope spots from Luger. Kind of a strange way for Luger to win the title as a babyface. Windham throws a tantrum after the match and Piledrives Luger on the title belt. Backstage we hear from the new Television Champion Mike Rotunda. He says maybe he was lucky tonight, but all anyone will remember is that he won. Road Warriors are out to "Iron Man" by Black Sabbath and a huge pop from their kayfabe hometown crowd. Sullivan and Williams are members of the Varsity Club, a stable of former amateur wrestlers. Sullivan starts against Animal. Sullivan goes up top early. Animal sloppily catches him and slams. Sullivan tags out to Williams. Animal shoots him to the rope, Powerslams him, and tags in Hawk. Williams hits a very impressive Press Slam. Double Clothesline from the Road Warriors. Sullivan tags in and he and Williams double team Animal. Sullivan hits Animal with a chair behind the referee's back. Arm work from Williams and Sullivan as they tag in and out. Eventually Hawk gets out, they do a double KO spot and Animal tags Hawk. Hawk comes off the top with a Shoulderblock while Williams simultaneously pins Animal. Hawk and Sullivan were the legal men, so the Road Warriors retain at 8:27. Analysis: **. Not bad, but needed more time. Backstage, we hear from Lex Luger. He's honored and humbled to be the new United States Champion. Steamboat is out first with his wife and son. Flair has a group of trumpeters play him out. He also has a group of beautiful women. Love how the entrances build this up and a big match and establish the character of the men involved. Flair gets a lot of cheers. Steamboat with a quick Shoulderblock and cover. Steamboat gets another two count off a roll-up and Flair bails. They exchange hard chops. Steamboat chops Flair in the face and knocks him down. Steamboat keeps control with a headlock. He's confident and in control. Flair repeatedly rolls Steamboat into a cover. JR puts over Steamboat as the common man whereas Flair is from an affluent background and attended boarding school as a child. Flair bails after another near fall. They run the ropes and Steamboat knocks Flair down with a double chop. Flair rolls out of the ring. Back in, Steamboat hits a Hip Toss, Headscissor, and a Dropkick. Flair catches Steamboat with a back elbow, but Steamboat gets back up and knocks him out of the ring. Steamboat climbs to the top rope, but the referee won't let him jump off at Flair. Steamboat goes outside and Flair takes over with a rake to the eyes. He slams Steamboat into the guardrail. Back in the ring, Flair hits a Snapmare and drops a knee. Double Underhook Suplex by Flair. They trade chops. Flair is thrown to the corner, does the Flair Flip, runs to the opposite turnbuckle, and dives off with a Body Press. He connects, but Steamboat rolls through for a two count. So don't let anyone tell you Flair never hit a top rope move after Starrcade 1983. Steamboat goes for a 10 Punch, but gets an Atomic Drop and Flair applies the Figure Four. Steamboat hits the mat repeatedly. Today, that would be considered a tap out, but this is when submissions were only signaled verbally. Flair grabs the ropes for leverage. The referee eventually catches Flair and forces him to break the hold. Flair attacks the legs. Steamboat fights back with chops. Flair hits a Body Press and both guys fly over the top rope. Flair sends Steamboat flying into the ring post. Flair Suplexes Steamboat from the apron into the ring. Back Breaker by Flair. Flair applies a chinlock while using the ropes for leverage. Steamboat rolls up Flair, but he kicks out. Steamboat tries a Flying Body Press from the top rope but misses. Nice mat series and a Double Underhook Suplex by Steamboat. Steamboat blocks a Hip Toss and counters with a Backslide. Clothesline from Steamboat puts both guys down. Steamboat goes up top and hits the Flying Chop. He goes up top again and hits a Body Press, but knocks the referee down in the process. Flair rolls Steamboat up, but there's still no referee. Steamboat goes up top while Flair checks on the referee, but misses a Flying Body Press. Flair goes for a Figure Four, but Steamboat rolls him up with a Small Package to win the NWA Title at 23:18. Analysis: *****. One of the great wrestling matches of all-time. These guys were both phenomenal wrestlers in every aspect of the game, and gelled perfectly. They went at it here non-stop for over 20 minutes. The crowd was hot, the moves were crisp, the story was perfect. Absolutely phenomenal stuff from both of these guys. Steamboat celebrates with his wife and son in the ring to the standing ovation. He got some boos during the match, but the response after is mostly positive. Backstage, we hear from Steamboat. Luger, Steiner, and the Midnight Express bathe him in champagne to celebrate his win. That's a nice little touch that we never see anymore. Steamboat tries to deliver his promo despite the fact that he has champagne in his eyes, which burns. He promises Flair a rematch. The announcers close it out by noting that three out of four championships changed hands. Great show. The main event is an all-time classic and all the matches other than Sting/Reed were good to very good. This is the first WCW show and it was a great way for the company to get started.